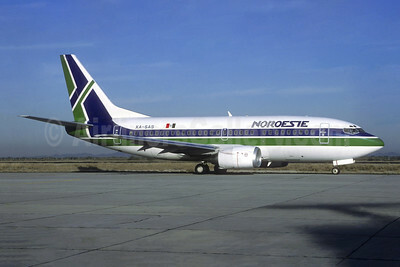 (Aviación del Noroeste S.A. de C.V.). (ANW) (Hermosillo) 1988 - 1996. Photos. Framable Color Prints and Posters. Digital Sharp Images. Aviation Gifts. Slide Shows. Noroeste Boeing 737-5Y0 XA-SAS (msn 25191) HMO (Christian Volpati Collection). Image: 945587.